America's Beauty Show has impressed me in recent years with its tech-savvy. Last year, there was a QR code in the printed program that, when scanned, took attendees to the “ABS Mobile Program (the program and exhibitor guide online). I downloaded it a few days ago, and, while it's real trial will be on the show floor itself, I'm impressed with it already. 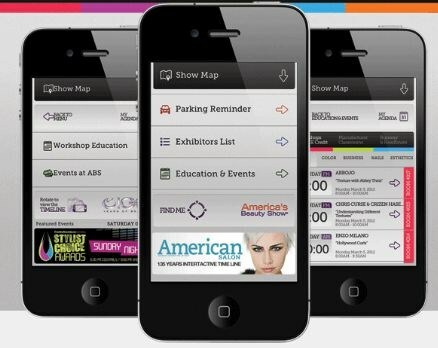 It includes a searchable exhibitor directory, a list of classes (from which you can add select ones to your agenda, which I did with CND's Shellac Couture event on Monday, parking reminders (so you can tell yourself which lot you parked your car in), and, if you turn the app horizontally, a neat timeline of ABS through the years. I'm hoping that I can get by this year without picking up an actual printed program. In the meantime, use the app to find your favorite booths at the show, including of course the NAILS Magazine booth (#3306), where we'll be offering discounted subscriptions and renewals. I'll plan on live-blogging my new product finds from the show, so feel free to e-mail me at sree.roy[at]bobit.com if you see something on the show floor that you'd like me to check out and report on. Also, feel free to e-mail me photos of what you're buying on the show floor.